On our last trip to the south coast we re-visited Birling Gap – the day I also shot the image ‘To Infinity’ that featured in my previous post. Click the link if you haven’t seen that. The light was soft, the tide was high, and the sea close to the coast had a paler hue due to the large amount of chalk sediment in the water. The coastline had a lazy feel to it. The incoming tide had worn away the shingle on the beach in a repeated pattern so that the tide appeared to have teeth. Why this had happened I know not, but it added interest to the picture. 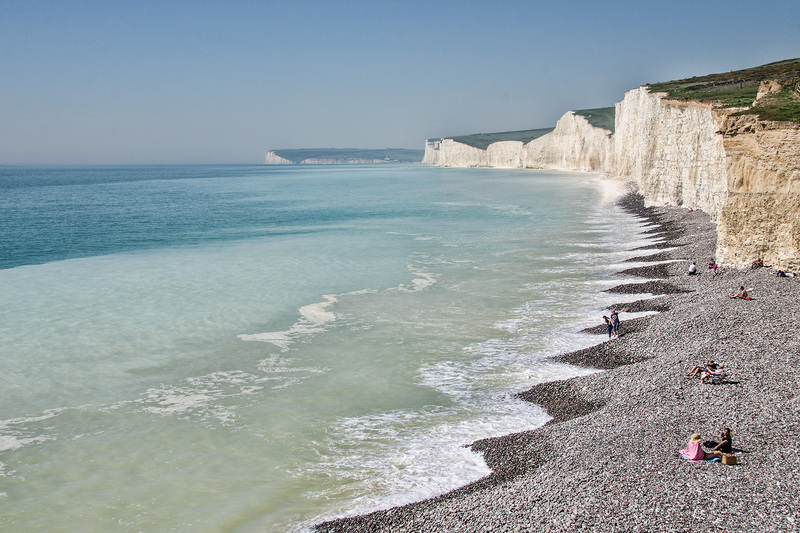 This entry was posted in Coast and tagged Birling Gap, coast, Coastline, Photography, Seven Sisters. Bookmark the permalink. I would agree….a great view, Andy! We’re very lucky to have this within easy reach. It’s a beautiful spot. I didn’t think of teeth at first, but of a zipper: a means of holding together land and sea. A stunning shot. The patterns on the shingle and the colours of the sea are excellent. Thanks Lynn. I’ve never seen ‘teeth’ like this before and the colours were special too. It was a good day out.